Model of a collagen helix. 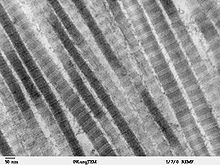 TEM image of collagen fibres. In collagen, the collagen helix, or type-2 helix, is a major shape in secondary structure. It consists of a triple helix made of the repetitious amino acid sequence glycine - X - Y, where X and Y are frequently proline or hydroxyproline.A collagen triple helix has 3.3 residues per turn. Each of the three chains is stabilized by the steric repulsion due to the pyrrolidine rings of proline and hydroxyproline residues. The pyrrolidine rings keep out of each other’s way when the polypeptide chain assumes this extended helical form, which is much more open than the tightly coiled form of the alpha helix. The three chains are hydrogen bonded to each other. The hydrogen bond donors are the peptide NH groups of glycine residues. The hydrogen bond acceptors are the CO groups of residues on the other chains. The OH group of hydroxyproline also participates in hydrogen bonding. The rise of the collagen helix (superhelix) is 2.9 Å (0.29 nm) per residue. ^ Berisio R, Vitagliano L, Mazzarella L, Zagari A (February 2002). "Crystal structure of the collagen triple helix model [(Pro-Pro-Gly)(10)](3)". Protein Sci. 11 (2): 262–70. doi:10.1110/ps.32602. PMC 2373432  . PMID 11790836. Members of this family belong to the collagen superfamily . Collagens are generally extracellular structural proteins involved in formation of connective tissue structure. The alignment contains 20 copies of the G-X-Y repeat that forms a triple helix. The first position of the repeat is glycine, the second and third positions can be any residue but are frequently proline and hydroxy-proline. Collagens are post translationally modified by proline hydroxylase to form the hydroxy-proline residues. Defective hydroxylation is the cause of scurvy. Some members of the collagen superfamily are not involved in connective tissue structure but share the same triple helical structure. The family includes bacterial collagen-like triple-helix repeat proteins [2,3]. Members of this family belong to the collagen superfamily [PUBMED:8240831]. Collagens are generally extracellular structural proteins involved in formation of connective tissue structure. The sequence is predominantly repeats of the G-X-Y and the polypeptide chains form a triple helix. The first position of the repeat is glycine, the second and third positions can be any residue but are frequently proline and hydroxyproline. Collagens are post-translationally modified by proline hydroxylase to form the hydroxyproline residues. Defective hydroxylation is the cause of scurvy. For those sequences which have a structure in the Protein DataBank, we use the mapping between UniProt, PDB and Pfam coordinate systems from the PDBe group, to allow us to map Pfam domains onto UniProt sequences and three-dimensional protein structures. The table below shows the structures on which the Collagen domain has been found. There are 302 instances of this domain found in the PDB. Note that there may be multiple copies of the domain in a single PDB structure, since many structures contain multiple copies of the same protein sequence.